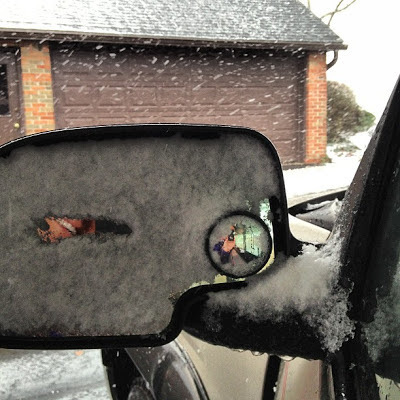 The snow started just after noon for many people once the atmosphere got moist enough. The snow is generally moving from west to east with a little northerly push. Still keeping with yesterday's forecast with 1-3" by midday Tuesday for most of Ohio. Slightly lower amounts to the far north and the far south and slightly higher amounts along I-70 across Central Ohio. I spent the morning watching Star Wars on BluRay while I finished wrapping the last of the gifts. (I ALWAYS loved Star Wars on snow days off of school). Anyway, we are having Dawn's company dinner/cousin's get-together tomorrow. 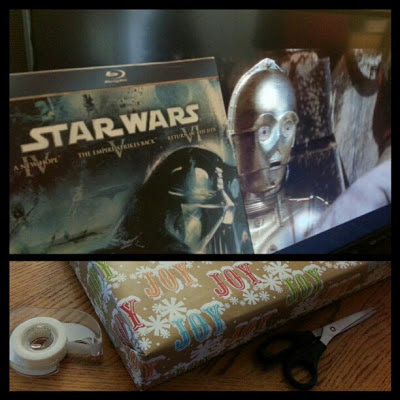 I was happy with how Star Wars turned out on BluRay, but not too stoked about the newly added scenes. Enjoy the snow tonight and early tomorrow.... because then we get into a much drier pattern, but also MUCH colder with overnight lows dipping to near or into the single digits. Happy Early New Year, and have a good one! P.S. If you want to check the radar make sure to check out the iRadar on the Station's weather page: http://www.abc6onyourside.com/shared/weather/features/local/wsyx-index.shtml. You can zoom down to your street and it even has it's own version of Futurecast. The forecast for the snow was right on cue. 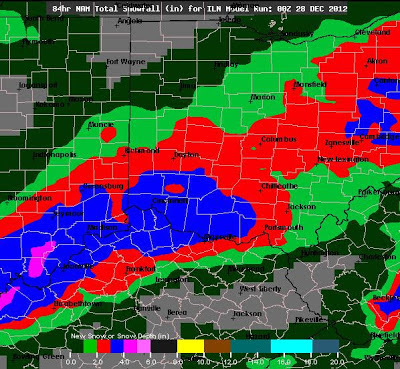 Most of Central Ohio got between 2"-4" with higher amounts expected with the 4"+ range that saw the heavier bands of snow. 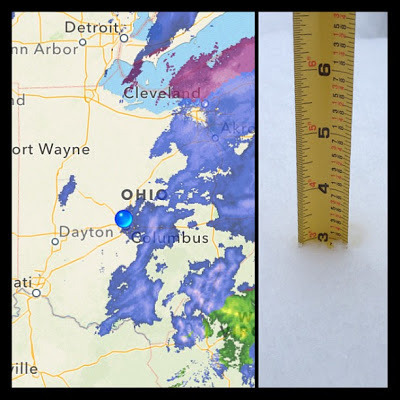 For example, I only saw about three and a half inches where I lived, but just a few miles away at the Port Columbus airport, they saw 5.9" yesterday. So it really depended on your location, but most saw the 2-4" range. The National Weather Service office out of Wilmington made a great map of their forecast area and their reports from weather spotters. 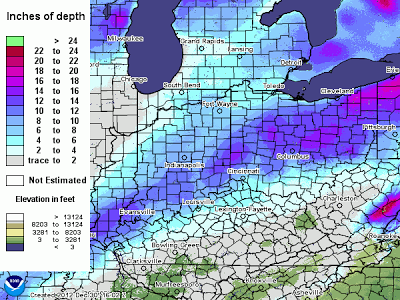 Another great NWS map is the current snow pack and you can see how there is a pretty distinct line of deeper snow from Evansville up through Youngstown for the last two systems. As far as Columbus's snow comparison, we have now topped last years snow with only three systems. The 5.9" yesterday really pushed us over the limit and now we just have the sky as our limit. 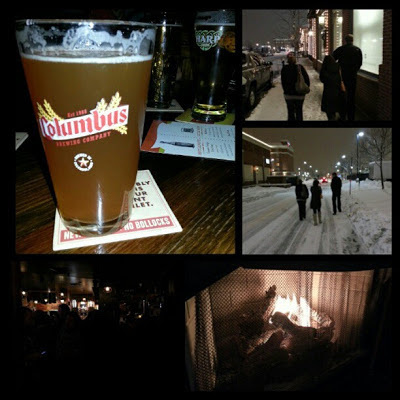 Columbus did break the old one-day record of snow for Dec. 29th, which used to be 3.6 inches. 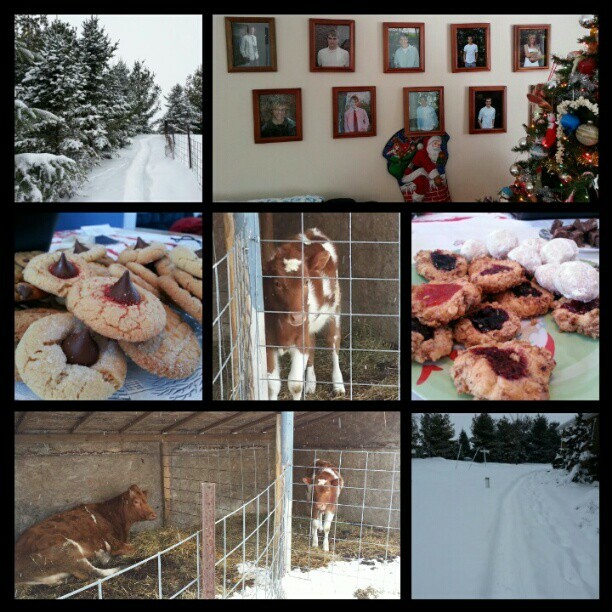 Luckily the highways were treated well and Dawn and I went back to my parents farm to celebrate Christmas. It was a lot of fun and there was plenty of good food. I sometimes miss the quiet life on the farm, but love all that the city has to offer. When we got back into town we met up with a few friends for dinner. We then trekked through the snow to find a little hole in the wall with a fire. Quite a lot of fun, but we didn't realize we had walked so far until the walk back... because the walk back was against the wind and falling snow... not fun for those not prepared(I had gloves and everything). Today, I got to watch the Browns lose another game, but that is the last one for 31 weeks until preseason starts up. 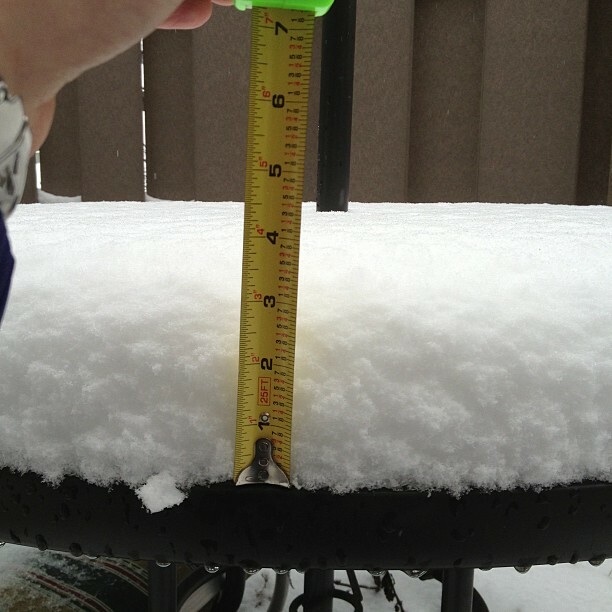 Well even though we already topped last year's snow... more on the way. Clouds are starting to move back and and that is good news to keep our temperatures from bottoming out. Clear skies and a fresh snow pack can mean single digit lows without a problem. With the clouds coming back in we should bottom out in the mid teens, if not lower teens in spots. Clouds increase on Monday with snow arriving mid afternoon Monday and expecting light snow through early Tuesday. Snow totals will be much lighter with most of the area seeing 1"-2" and then isolated spots along I-70 may get a few pockets a little more than that according to the latest models. All-in-all a light snow that shouldn't cause too many problems, but still will be a little slick Monday night into Tuesday morning. Then we quiet down for a little bit. We could see a few flurries later in the week(Right now looking like , but other than that we stay quiet for now. Well quiet, and cold... with the pattern starting to settle that will mean clearer skies pushing in so be prepared for some FRIGID mornings to come. Meaning, check your anti-freeze in your vehicle. I will have another update on the snow tomorrow... still filling in for Bill Kelly. Have a good one! Snow showers developing around midnight tonight and continue heavy at times through mid-morning on Saturday. A few lingering light snow showers through the afternoon on Saturday. Expecting between 2"-4"+ for most of Ohio with slightly lower amounts to the far north and far south, 1"-3". Areas near the Ohio River could see a brief wintry mix near daybreak, which would lead to the lower amounts of snowfall. Staying cold with a little more sunshine on Sunday and then another chance for a decent snowfall later New Years Eve into New Years Day, next week. We could see another 2-4+" next week, but it still early, so stay tuned... Next week's system has stayed fairly consistent, but recently has started to show a little strengthening. A little bonus information for you.... By this time next week Columbus should have broken the seasonal snowfall totals compared to last year. Dayton will likely break last year's total by tomorrow morning. As far as temperatures, we will be staying cold through the end of next week so the snow will not be melting anytime soon. Yay for local skiers! In other awesome news... tomorrow will be my first weekend day off of work since August. I am pretty stoked and will be visiting the family farm part of the day. Drive safe Saturday and have a good one! The National Weather Service has now issued a Winter Weather Advisory for tonight's snow. We are right on the cusp of weather it would be an advisory or not. It is definitely less snow than what we saw two days ago, but still enough for some problems. 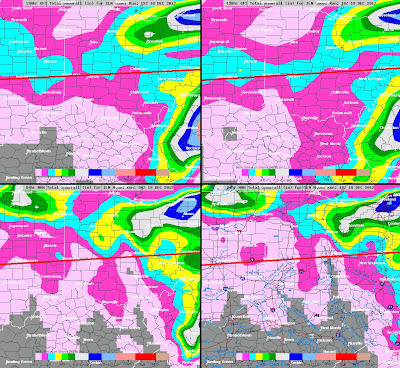 The above image shows between 2-3 inches for areas between Cincinnati, to Columbus to Youngstown. This image shows a little more. It shows a decent swath of 4-6" along the same track from Dayton/Cincy to Columbus to Youngstown. The both agree on the streak of the heaviest snow and are close enough for the snowfall totals. My thoughts are that along the heaviest snow bands we could see 2-3" with isolated places seeing the 4" or slightly more. For areas on the fridge, such as Lima to Cleveland and Ripley to Athens... 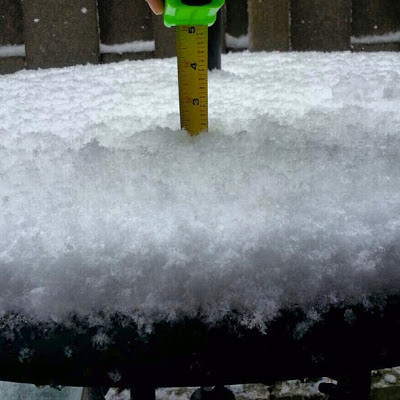 I think 1-2" is easily possible. Then the snow totals get higher heading toward the middle of the state. The areas near the Ohio River could, again, see a little of the wintry mix, so watch out for a little icing. I was calling for 1-2+" for the system yesterday and was waiting for the models today to bump up the middle ground of the state. The snow will start around midnight tonight or a little earlier to the far south and west part of Ohio. It will continue through about 10AM then lighter snow showers from time to time on Saturday. We then dry out for a few days then another similar round of snow for New Year's Eve night and that looks to be slightly more potent... I will keep a close eye on it. For everyone who has followed my blog for the last several years, HUGE thanks! 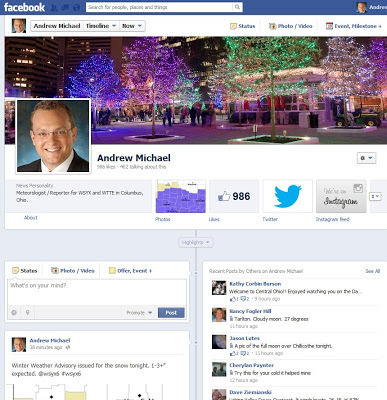 And for everyone who "Liked" my original Facebook page (imaged below) another HUGE thanks. So feel free to either search for "Andrew Michael" in the search tab, click THIS LINK, or if you look to the right hand side of this page there is a Facebook logo and that will direct you to the correct Facebook page. I just decided I didn't want to fill the feed of people who "Like" both pages, so be sure to head on over and "Like" the page that will still be there on December 1st. Thanks to everyone who has already done that. Something small, but has been bothering me for a while. I hate double posts. I will have another blog entry coming up tonight with any subtle changes to the snow for tonight, but I think this system is a LOT more stable and less movement. Have a good one! I worked a thirteen hour day yesterday and went home to an inch of ice and four more inches of snow(after it was done falling). Buckeye was loving the snow and running around in it. 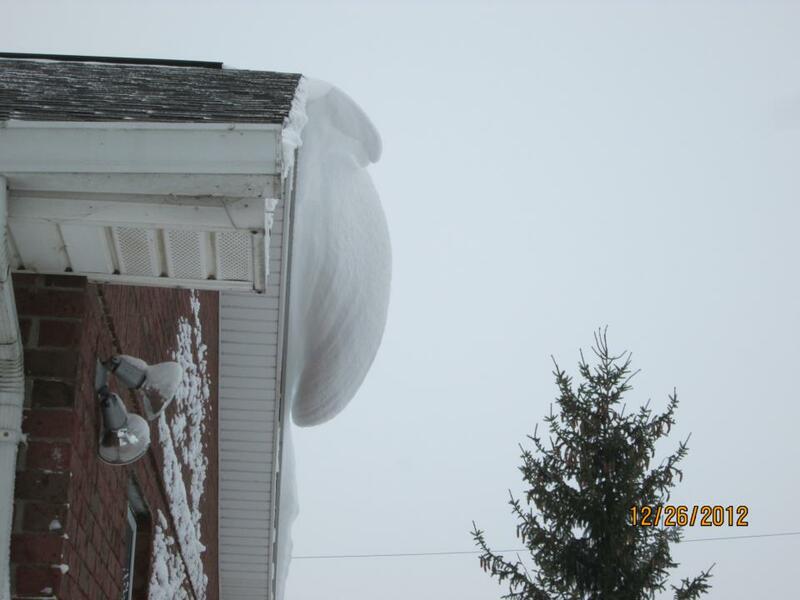 We always get some sweet drifts of snow back at my parents' house in Western Ohio and my sister took a picture of a drift that was hanging over the edge of the roof. My dad also said that the road has a few feet of snow in the drift. They cut through a hill so the road didn't have a steep hill, but now it drifts shut every winter. I did a little comparison between this winter and last winter for Columbus... we are halfway of beating last year's snowfall total. Dayton already has a jump on Columbus since they saw more snow yesterday. They are 0.6" away from breaking last year's total and by the time we get through the weekend, they may beat last year's total. Thanks to all the low-level moisture the clouds will be sticking around for a while. Temperatures will fall into the teens tonight and salt alone looses its effectiveness anything lower than 20 degrees. Be careful for patches of ice Friday morning. Friday night light snow showers will develop with light accumulations expected, around 1-2" by Saturday. A little more sun heading into Sunday and staying cold with another slight chance for snow as we ring in 2013 Monday night. I will keep an eye on things, so be sure to check back in. In the meantime, be careful for the re-freeze and have a good one! Wanted to jump on here real quick... not a lot has changed with the forecast. I AM having a LIVE CHAT on my station's facebook page. Feel free to stop by and join the chat. 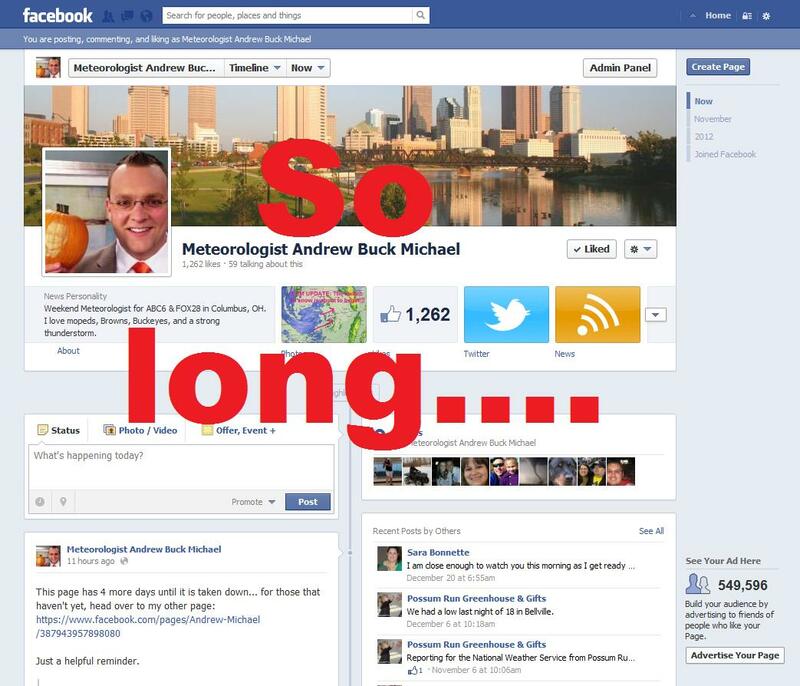 https://www.facebook.com/pages/Andrew-Michael/387943957898080 I would love hearing what you are seeing to help pinpoint the rain/snow/ice line. ANY freezing rain or rain will drastically cut down on your snow totals. ***AVOID TRAVEL TODAY IF POSSIBLE*** Heavy snow and wintry mix expected today. Roads will become extremely treacherous by midday. 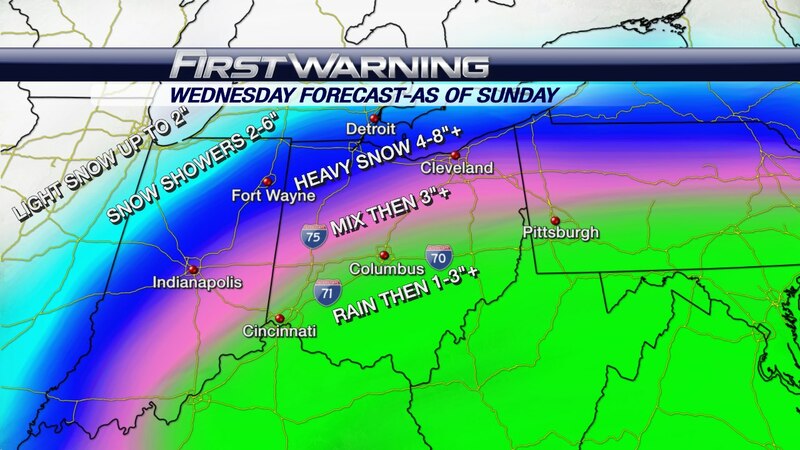 The heaviest snow will stay north and west of I-71 where the entire event is expected to stay all snow. Any early wintry mix will drastically cut down on snowfall totals. Snow tapers off some overnight with light accumulations on top of what is expected today. Another weak system looks to move in for Saturday. Come visit my LIVE CHAT and have a good one! Boy, when you visit the National Weather Service's webpage you KNOW something bad is on the way. 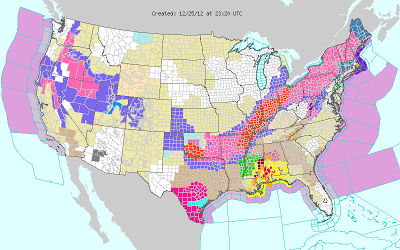 There are blizzard warnings from Indianapolis to Cleveland. 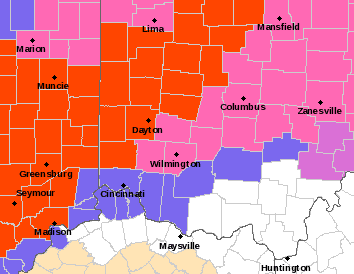 Dayton is included in that, but as of 7PM the blizzard warnings border Columbus and Franklin County, but are not part of it. As a matter of fact there is a tornado outbreak across parts of Mississippi and Alabama. This storm is quite a beast and you can see the pink shades of the snow that it is going to drop from Texas up to Maine. The main reason I wanted to jump on here for one FINAL blog entry. I know I said that this morning, and I DO have to be up at 1:15AM for work, but this storm has been changing and the one MINOR, but HUGE change is the temperature... by 2 degrees! Ohio is going to be divided between all snow and the ice and the ice line looks to be a little more north than the last entry... here is why"
Here is a cross section of the atmosphere. The graph goes through time until Saturday morning. It goes up into the lower parts of the atmosphere so you can see the temperatures. Tomorrow morning there will looks to be a pocket of warm air between about 2000 and 3500 feet above the surface of the earth. It will only be about 32, 33, or 34 degrees depending on your location, but that will be enough to cause some big issues. 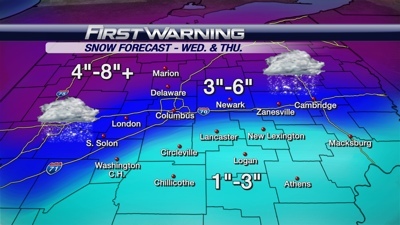 First is the fact that it may not stay all snow for Columbus or even Dayton. Areas along I-70 and south will see this warm pocket, IN SPOTS, and freezing rain may fall or even some ice pellets. This will SIGNIFICANTLY drop the snowfall total for that location because it will melt the snow and then fall in a much more compact for of precipitation... ice or freezing rain. Areas north of I-70 should remain freezing all the way up into the storm so it will stay all snow, but for an example take a look below. 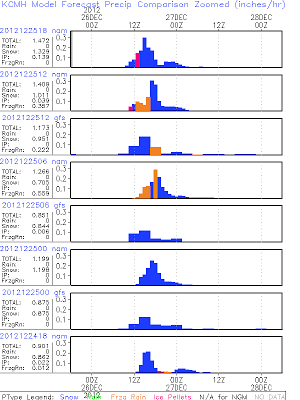 This is the last 24 hours of forecast models for Columbus showing accumulation of precip through time. The blue is snow. The earlier models showed nearly all snow, but the last couple models are showing that brief pocket of the wintry mix. This image shows the areas that are forecasted to get freezing rain for tomorrow morning and anywhere south of I-70 is possibly going to see the ice. This will be in pockets so you may drive a mile one way and not see the freezing rain, but you do at your house. It will be a "nowcast" event in the morning where you will need to just keep up-to-date with the radar. With all of this out there I still stick with my forecast from this morning. The ice may make its way as far north as I-70 and again, if you see see freezing rain, you can knock about an inch of snow off your total for every hour you have a wintry mix. There will be a line from West Central Ohio up to the Cleveland area that will see close to a foot of snow, but most of us will see less than that. I will be working a long day tomorrow and make sure to tune in. We will also be streaming a lot of the coverage online on www.abc6onyourside.com. Bill Kelly will have an even more up-to-date look at the storms on FOX28 at 10 and ABC6 at 11 so be sure to check that out tonight... Time to get ready to head to bed and get what little bit of sleep I can get before I wake up at 1:15AM. Have a good one! Thanks to all the readers the last few days. My blog has went off the chart with views. I especially want to thank you for my crude graphics and typos the last several entries since they were all done from phone(forgot my laptop while I was out of town). So the image below is my final thoughts before the snow arrives. The storm has bounced around a lot on every model but there is finally some agreeing. I would not be surprised with Blizzard Warnings for parts of Ohio, but they have yet to be issued. I think the one thing we will be missing is 35+ mph wing gusts for three hours. 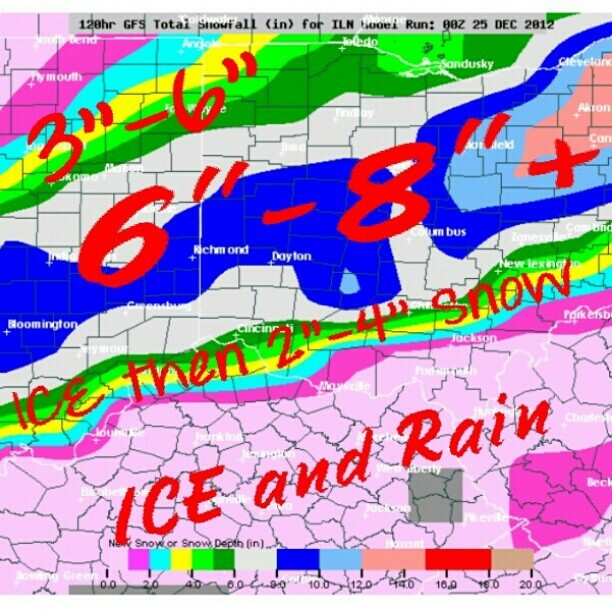 Southern Ohio will get a decent amount of ice and then some snow and where the ice line ends and just north...get ready for some insane snow. I would avoid driving tomorrow if you can. The precip will start near daybreak an fall heavily through the afternoon. I will be tracking it ALL morning on-air at work so be sure to watch ABC6 on TV or steaming online for all of the latest. Stay safe, Merry Christmas, and have a good one! I was just forwarded this travel forecast from Jeff Booth and it clearly paints the picture of what to expect by the late afternoon on Wednesday if you are planning on traveling. More snow expected after Wednesday evening so bare that in mind. Thanks Jeff. 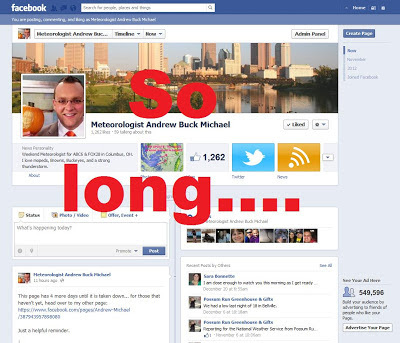 For more on my thoughts on final snowfall totals then read my last entry below...posted several minutes ago. Update: I included the 0z GFS snow forecast. I agree with this model more than any others I have seen this week. There are a few things I could nitpick, but at 12:37 AM on Christmas I agree with te concept and am heading to bed. Time to work on some addition...cuz we are adding to the snowfall totals. The image with First Warning at the top is from Bill Kelly this afternoon. At the time I agreed, but the snow/ice line has moved further south and that means the snowfall will be more than anticipated, especially along the I-70 corridor. 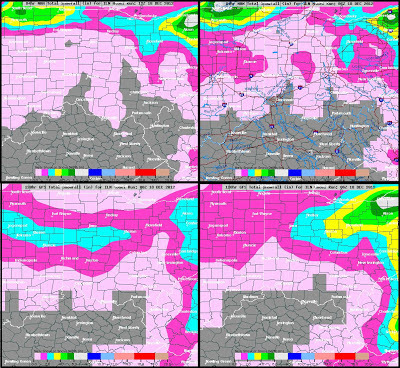 The second image is the evening NAM forecast. While I think the NAM is overdoing the forecast a tad...it is possible. The precip will start early Wednesday morning and fall the heaviest through the late morning and early afternoon Wednesday. Most of the precip will be done by Wednesday night at midnight other than a few light snow showers. At this point I think areas to the far Southeastern parts of Ohio will see a bit of sleet/freezing rain and only see a few inches after the switch back to snow(midday Wednesday). For areas along the I-71 corridor from Cincinnati up to Columbus and then from Columbus to Wheeling along the I-70 corridor...I think will remain all snow. That means a LOT of snow. I think along these mentioned corridors (and slightly north) we could easily see areas with 8"+. The northern third of Ohio will see 4-8" still and lower amounts the further north you go. This has been an evolving storm and appreciate all the feedback and patience. This will likely be a record breaking storm for areas that see the worst of the punch. I am working a double shift Wednesday morning so I get the fun task of tracking this monster. I hope to have another update on Christmas to finalize any subtle changes. Thanks and have a good one. From the 1AM to 7AM models there is a clear shift south. This will mean moving the forecast further south too compared to yesterday. More to come later. By later this afternoon and evening much more concrete forecast. Need these models to stop shifting. It barely got above freezing today, but you could EASILY see how the sunshine helps melt the snow. Quite impressive! Enough with that... let's get to the forecast! Feel free to click on the next couple of images to make them larger. So there are A LOT of "forecasts" getting thrown around and I want to explain why I am thinking the forecast that I am going with... The above image shows how the closer to the low pressure you are the warmer it gets. The low pressure will keep the warm air close to it and keep the precipitation as rain. A little further to the left of the low, you will have a wintry mix because the temperatures are right near the 32° and will result in some rain, freezing rain, or sleet. If the temperatures stay cold enough all the way up into the atmosphere then you will stay as snow, but still close enough to the main moisture source(the Low). This band west of the wintry mix, that is just below freezing, will result in heavy snow and then even a little less snow further to the left as you get further from the Low. So if the low pressure moves a little bit then the precipitation will also move right along with it. So knowing all of this... 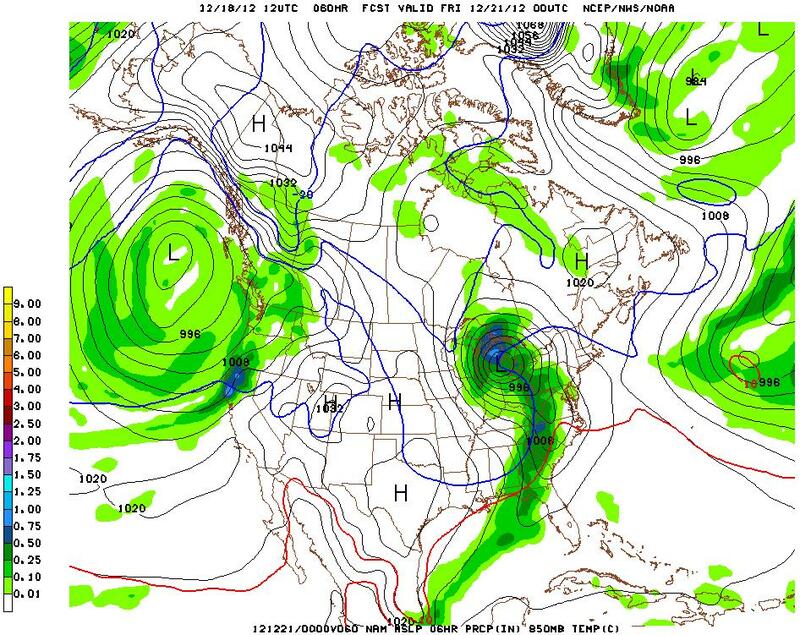 The above image is the model runs from the Euro, Canadian, and two American models. The foreign models are definitely trending further east. The one thing I want to point out is that nearly each individual model run trends further west. They ALL are slowly moving westward. If that continues the next couple days, then we will be seeing the warm core moving right up toward the Western parts of Ohio meaning more snow. 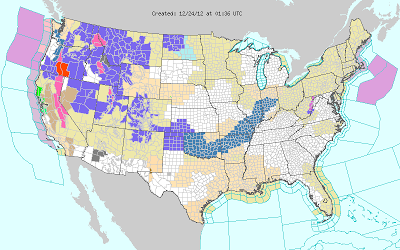 Here is the current watches and warnings across the country. The dark blue is the Winter Storm Watch for this storm. The National Weather Service is trending even further west with this storm than I am thinking right now... they may be favoring the American models a little more or the fact that they are seeing the trend of the models moving west each model run... Regardless... it is going to be interesting and as you can see the models are still trying to decide on the track. Tonight we stay dry and see increasing clouds. A weak system rolls in for tomorrow. Morning temperatures will be near freezing and we could see a brief wintry mix near daybreak turning back over to rain showers quickly and light scattered, hit or miss, rain showers for the remainder of the daylight hours. Once the temperatures fall in the evening then a few flurries will fall around Ohio and last into Christmas morning. Just a few light flurries... wish it was more. Other than a few early flurries on Christmas we will see partly cloudy skies and chilly temps. The system on Wednesday starts near daybreak and will last throughout the day. Heaviest precip looks to be in the first half of the day... so any rain will mean a significant drop in snowfall totals. Once the temps fall in the evening a light snow will stick around into early Thursday with an additional half an inch to one inch of snow. I am hoping a "dry slot" does not move in Wednesday night. That is when cold dry air punches in and it drys out the atmosphere and cuts off snow formation. We dry out Friday and then another weak system on Saturday with another inch or two... still a long ways out. 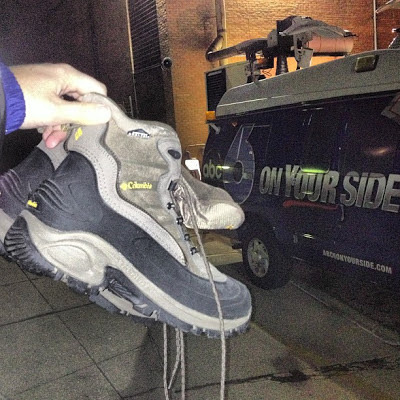 Someone WILL get blanketed in snow later this week and I will be back to update you on the track of the storm. Until then, take time to enjoy those around you. I will be off of work the next two days and back on-air for Wednesday's morning show, so I will need to keep up-to-date on the storm. I will be blogging from the road during the next few days, so please check back in because this storm is not yet settled down. Travel safe and have a good one! I was looking back at my last couple entries, and I forgot to leave out what I did when the storm started. 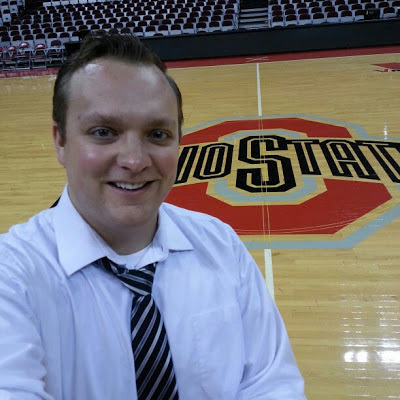 I mentioned that I came in early Thursday to go to Ohio State to do a story on the new basketball floor. It was pretty cool to be there as they were unloading the new floor. 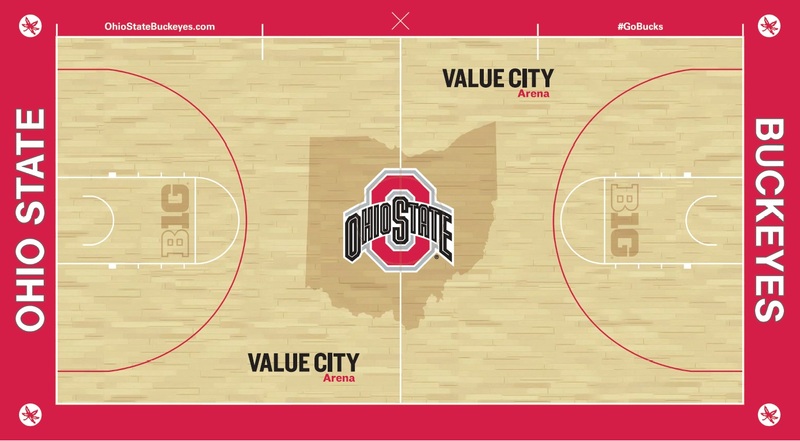 This is a rendering of the new floor and what it will look like once it is laid down after the Kansas game that is currently in progress. 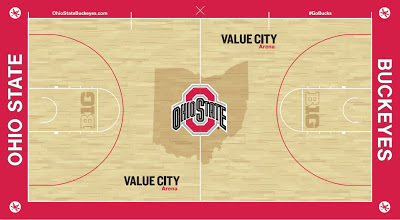 I like the new floor and love the darker stained state of Ohio. I was back at work by 6AM Friday for the morning show and the snow continued to fall throughout the afternoon. There is something about the first decent snowfall that makes me smile. It is almost like it brings out the kid in me. Lighter winds for Sunday with more sunshine. A wintry mix arrives early Monday morning. Southern Ohio will deal with more rain, but Northern Ohio will see more snow. Snow accumulations to the far Northern part of Ohio will be around an inch with a little more in isolated locations. The system will move out of here Monday evening, and Central and Southern Ohio could see a brief switch over to light snow, with little to no accumulations. We clear out a little for Christmas Day on Tuesday, but more snow expected Wednesday. The track of the Wednesday system will determine who will see the most snow, but as of the latest forecast models, it appears that parts of Ohio could see 3-5"+ of snow... it will all depend on the track of the storm, so it will be monitored closely. Another round of snow is expected by next Saturday along with some of the coldest temperatures of the season. Afternoon highs will warm above freezing the next few days and then fall back below freezing at night so be mindful of refreezing on sidewalks and pavement. Have a good one! The models are still showing at least another inch of snow for us through the rest of today, but, as we have already seen so far today... it will just blow everywhere. The winds will start to subside later today and the snow will taper off this evening. This weekend highs will be in the mid-upper 30's and more sunshine. So quite an improvement over today. Any traveling today would need to be done with caution. The bridges and even some of the surface pavement have reached the freezing mark and there were a TON of accidents today. Several of the Columbus highways were shutdown due to accidents and crashes. Next week is still a little questionable. Later Christmas Eve into Christmas Day, Monday into Tuesday, we will see a weak system bringing us light precip. The models are still making up their mind on the temps, but right now we are on the line between rain, wintry mix, and snow. Regardless of the outcome, it will be a light situation... THEN... I am not sure if you would consider what we are dealing with a "storm" with only 1-3" of snow and the winds, but if you don't consider this a "storm" then you may consider later next week a storm. There will be a Low Pressure system starting out near Louisiana and moving up the Appalachians. 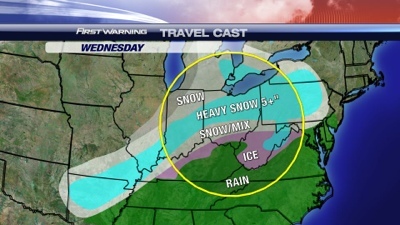 We will be on the west side of the storm and this could mean a plow-able amount of snow. It could turn out to be quite interesting so if you love snow... you will want to stay tuned. Even if you don't love snow... you will probably still be interested. It all will depend on the track of the low. A little more westward would mean a little more rain, but current track has us right in the sweet spot for a lot of snow. I will be updating this over the weekend since I will be here working... so I will see ya again soon! Travel safe today and have a good one! I have got a LONG day tomorrow. Going in early to get to Ohio State for a story. They are putting down a brand new basketball court. I will be in at least an hour early for that. Then I got my full day followed by volunteering at the Town Hall meeting that the station is having to discuss gun violence and mental health. Then I am back in on the morning show Friday morning. I would complain, but no reason, I love my job. To add to my great day, today... I got gas for $1.09! That is right! 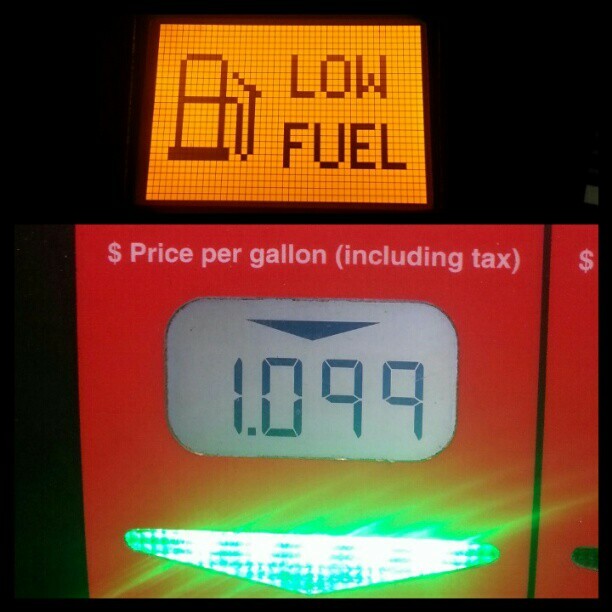 Kroger had a 4x fuel points on gift cards a week ago and for everyone that we planned on getting gift cards for... well they saved me at the pump. 26.2 gallons of that cheap gas! 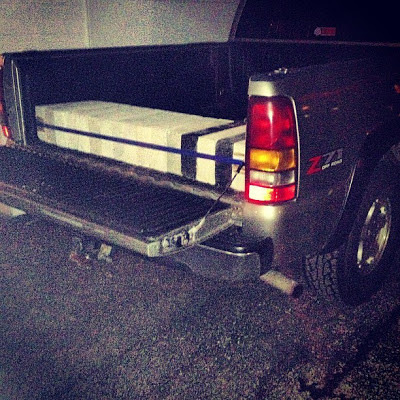 I also ran by the garage to put the weight in the back end of my truck for the icy roads on Friday. I won't have any time between now and then. Plus it is good practice to remember what an extra 600 lbs in the bed of my truck is like driving. So above is the forecast that Bill Kelly and I came up with this afternoon for the coming snow. Winds pick up throughout the day Thursday and max out Thursday night into Friday morning with gusts 50+ mph and then slowly drop of through the afternoon Friday. For Central Ohio, rain starts 8-11AM(slightly sooner for Western Ohio, slightly later for Eastern Ohio) Thursday and switches to snow by 8-11PM(slightly sooner for Western Ohio, slightly later for Eastern Ohio) and then snow continues Thursday overnight into Friday. 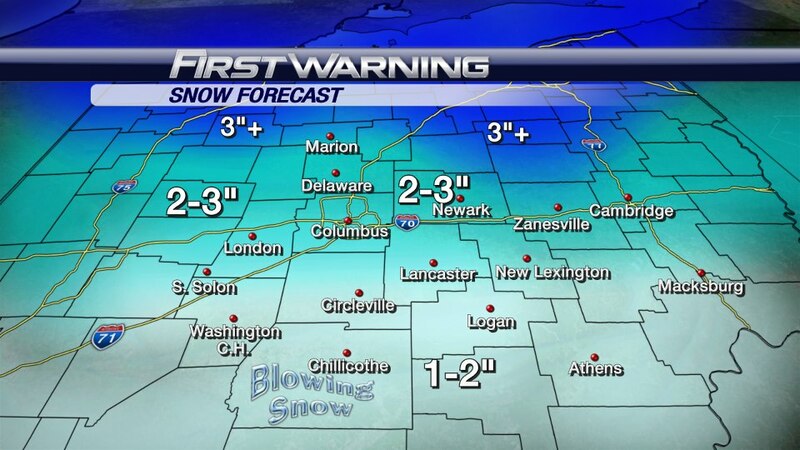 Snowfall forecasts for Central Ohio: 1-2" south of I-70. 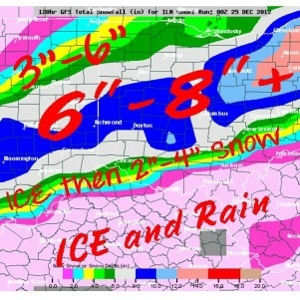 2-3" along and north of I-70 and then 3"+ to the Northern part of Ohio. 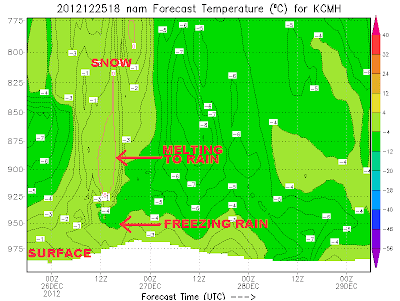 The forecast above was put together around 5PM and the 7PM NAM forecast model is below. The American model continues to increase our snowfall expectancy with each model run. 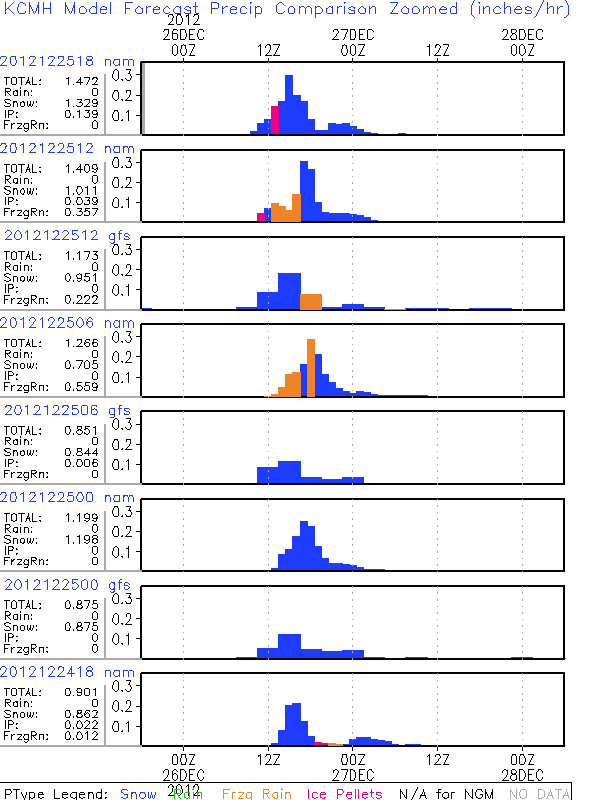 Check the last couple of blog entries and compare to see how the models continue to show more snow. I still think that the 5PM forecast we have is pretty accurate, but maybe slightly on the low end, for SOME areas. The hard part will be measuring the snow because I have no good explanation as to how to measure snow when the winds are going to be 40-50+ mph. There will be a lot of blowing and drifting snow. If you do not need to be on the roads Friday morning, I would recommend staying inside with a great Star Wars movie (that's what we did as kids when we had snow days.) The roads are going to be dangerous, not only because of the snow, but the winds will easily blow vehicles sideways on any ice. The snow ends later Friday and then our highs climb into the mid 30's through Christmas... so there is a chance that some of the snow drifts and some snow may still be around, come Christmas morning. Until I get another chance to sit down and update you... take it easy, stay safe and have a good one! Forecast is still holding solid from last night. 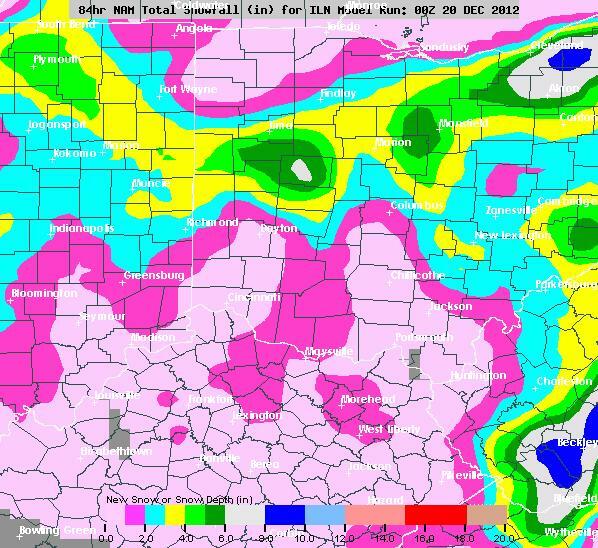 The American forecast models still are slowly climbing with their snowfall totals each model run. Take a look above at the NAM. Still calling for up to 1" south of I-70. Along and near I-70 1-2"+. North of I-70 2-3"+ and the 3"+ are for isolated locations. BUT remember, this all will be blowing and very hard to measure. Friday will be a mess on the roads. Winds will still be a big part of this storm from late Thursday into Friday. More updates to come. Have a good one! At least the way it looks right now, the Foreign models had a better handle on this Friday's snow than the American models... BUT the American models are finally joining the bandwagon. The American models(above, click to make larger, units in inches) continue to "up" their expected snowfall totals for the coming days... BUT!!! We CANNOT mention the winds enough. The winds will cause most of the falling snow to blow and even drift so do not expect a winter wonderland Friday. It will be a windy wasteland. The wind gusts will be reaching at least 40 mph if not 50+ mph. By definition by the NWS, a Blizzard Warning means sustained wind gusts of 35+ mph for at least three hours with blowing snow and reducing visibilities to less than 0.25 miles. There may be a chance for this Friday morning, especially across the north. The winds and snow are going to mean one of the nastiest mornings Ohio has seen in AT LEAST two years. We skipped winter last year. One more final thing to mention before I get to the numbers is the fact that the ground is still fairly warm so the first bit of snow will melt, but the strong winds will help to pull the warmth out of the surface, fast. So based off the latest information... here are my thoughts on snowfall totals. Up to 1" south of I-70. Along and near I-70 1-2"+. 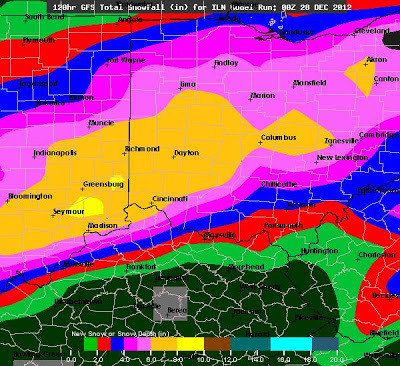 North of I-70 2-3"+ and the 3"+ are for isolated locations. BUT remember, this all will be blowing and very hard to measure. Friday will be a mess on the roads. Recap of the next few days: We stay dry Wednesday, then the rain arrives Thursday and we start to switch over to snow later afternoon on Thursday and the winds pick up late Thursday and the winds and snow continues into Friday. THEN we stay rather cold with highs in the mid 30's until the Christmas day. Stay tuned for any more changes to the forecast and have a good one! 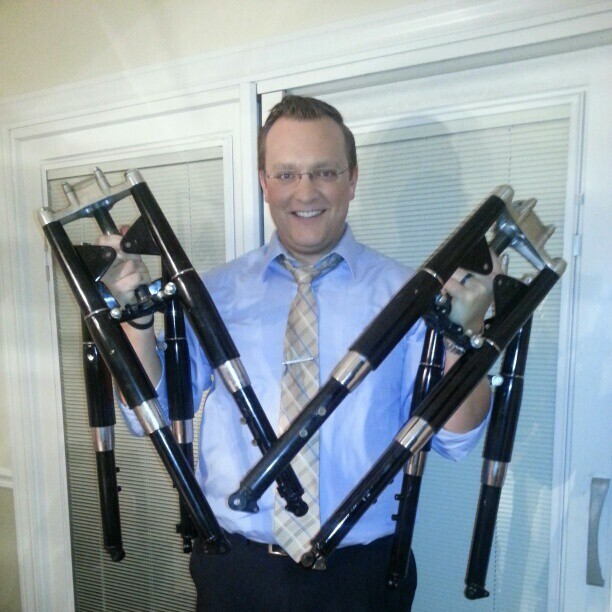 Some call me the king of k10 forks, I don't know why... Just kidding. I the k10 Suzuki forks on both of my mopeds and had to do a decent amount of fab work to make them work with disc brakes. 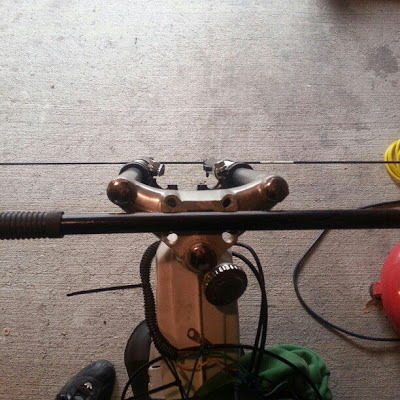 I thought I was going to need a new set of forks for my moped because after I crashed thanks to the loose gravel back in August they forks have been slightly tweaked to the right. So I ordered a new set and also got three more sets for my friends here in Columbus. So I spent the last couple days starting my winter projects. I started off by working on my Magnum because that had the least amount of work. 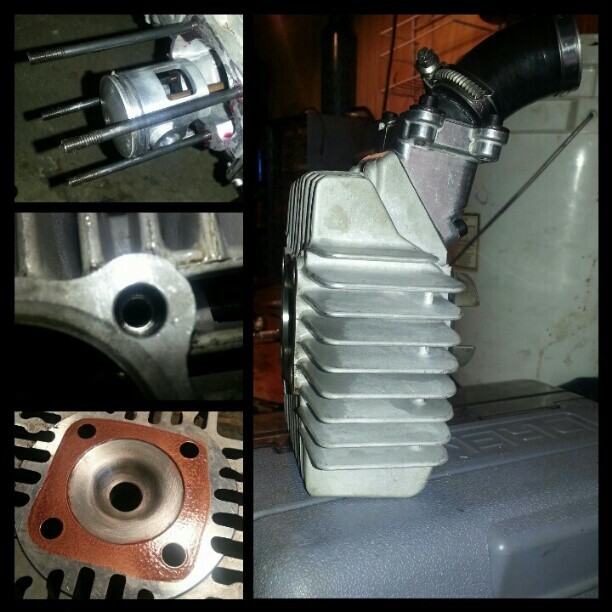 I added new Malossi cylinder studs, stud spacers, reassembled the top-end to assure no air leaks, and put it back together. Now all I have to do is wait for my WSL pipe from 1977 Mopeds. So I started to work on the Maxi and I knew I was going to need new bearing cups and I didn't realize how messed up they were until I took off the old ones. 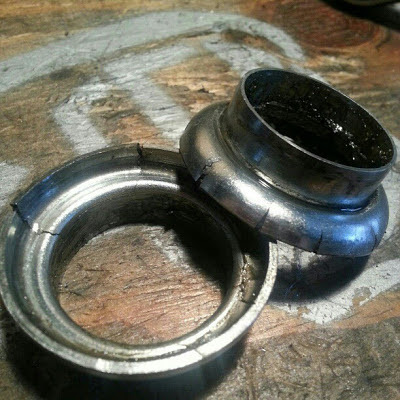 After one season of riding and the one accident, it was pretty clear that the cups were toast. Both the top and bottom had some pretty narley cracks and explained why my bike felt a little "loose" especially on turns. I put on the old forks and after readjusting the lower part of the triple tree I got them trued back up and they are as straight as an arrow again. I guess I will keep the last set of k10's for whenever the unthinkable happens. Hope I have that extra set for ever. Last night a couple of the guys came over to get some parts and forks and we hung out for a while. We are in the middle of voting for a name now and it is leaning one way a lot... I will let you know when the voting is over. I have mentioned a lot that the foreign (i before e doesn't work foreign) models have hinted at a decent more amount of snow. They have backed off a little, but still remain showing a decent amount more snow than the American models. However, I am showing you the American models above. That is the expected snowfall by Friday. (You can click on the image for a larger view) The units of measure is inches for the above image. 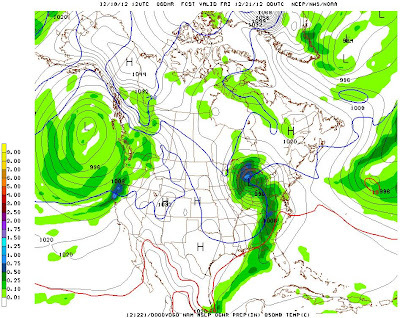 Just for fun, here is the Canadian model, above. The units for this is in mm water equivalent... but since snow is normally 10x more you can assume that the unit is cm of snow. Easy rule of thumb is that 1 inch is equal to 2.5cm. 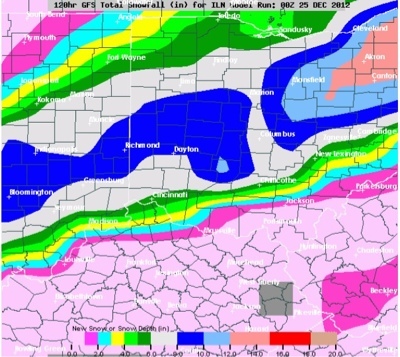 So central Ohio it shows some places getting a decent amount of snow... but remember this model is showing a decent amount more than some of the American models. You have to take it with a grain of salt. The rain will turn to snow later Thursday as that blue line pushes across Ohio, but look at the black lines. Those are the isobars(lines of constant pressue, and a GREAT indication of winds). Starting later Thursday into Friday we will have winds 20-30mph sustained with gusts 40-50mph. This will mean that it will really punch in the cold air, but the snow that will fall will likely blow and get lost in areas that shelter the wind. Imagine a baseball field next to a wooded area. The winds will pick up any snow on top of the grass and ,with the right wind direction, blow it into the wooded area where most of it will stay because the winds will die down. This will not be a nice snow that falls straight down and you can measure it in the morning. The winds will ruin all that for us. So, if you have a sheltered area, I think areas north of I-70 could see 1-2"+(the farther north the 2"+ range), but areas south of I-70 will see around a dusting. We are still three days out from this, but the models are all starting to agree on a middle ground. Again, this is if the area is sheltered from the wind. 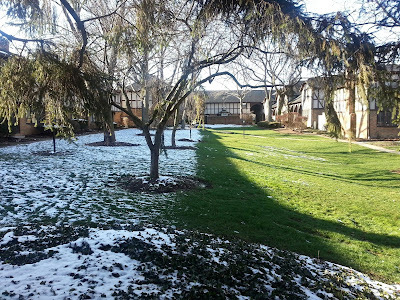 You will probably wake up and see less on your front lawn because the wind will blow it. Regardless the roads will become pretty nasty Friday morning. So mild and drier for the next couple days, rain Thursday, windy and changing to snow later Thursday into Thursday night, and then windy and cold Friday and through the weekend. Highs will climb into the mid 30's for the weekend and melt some of the snow... going to be interesting to see how much snow is still around by Christmas. I will be back with more updates so be sure to check back in. Have a good one!